I had a wonderful extended weekend in Helsinki. It was really nice to see my family and friends, spend time at the beach, sing karaoke, go to the cinema and thrifting at new spots. Here's snaps of some of my outings and outfits. 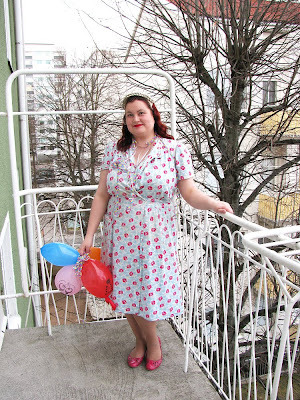 I wore the Able Grable Miss Betty Amanda dress to a friend's graduation dinner. The dress is based on a 1939 pattern, if I remember correctly, and it combines so many things that I'm crazy about; such as white on red polkadots, puffy sleeves and a big bow. LOVE! Mimosa at Fintage recommended a shop called US Eagle (in Tampere, Finland) for rare vintage finds. 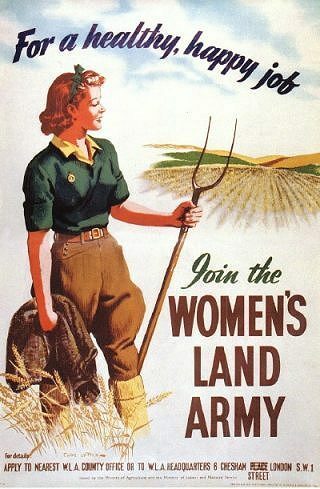 It is basically an army / survival type of store but there's also rare vintage army stock to be found. 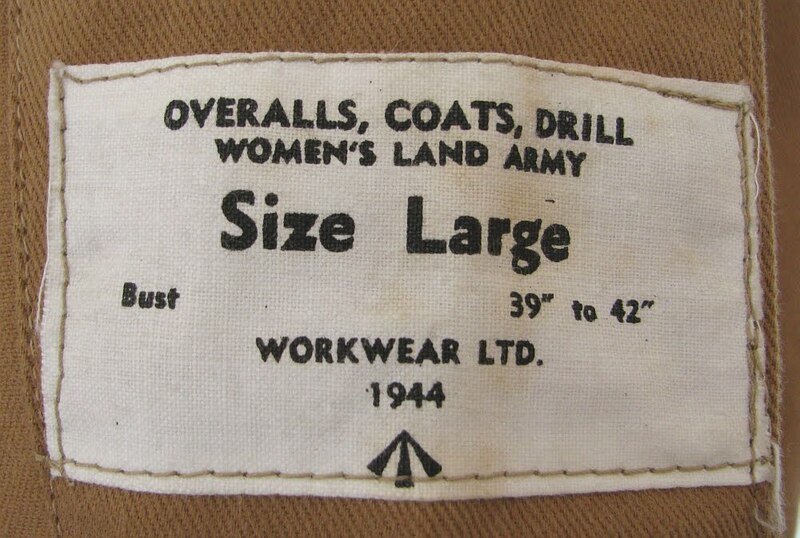 I went there to have a look-see and came across some mid-1940s Women's Land Army coats that appear to be unused. 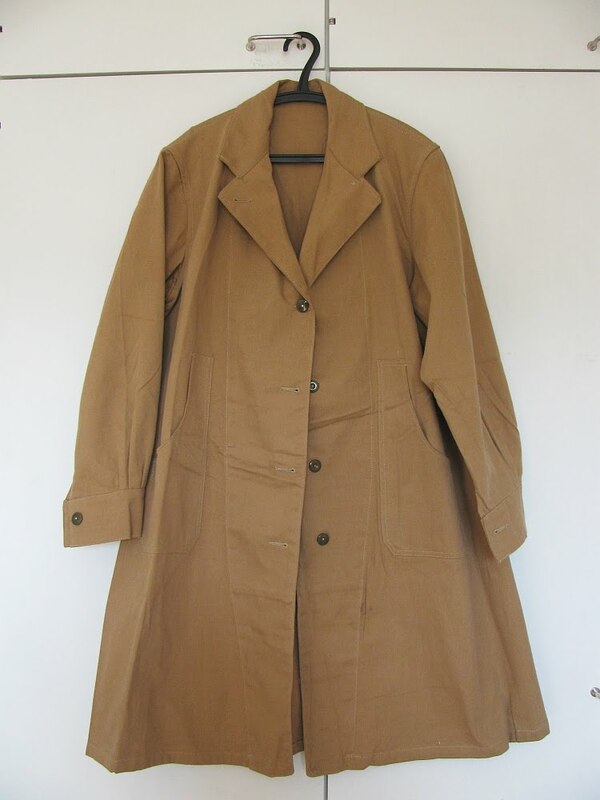 And the cost of a deadstock Land Girl coat? 4€ ($5). Quite a find, huh? 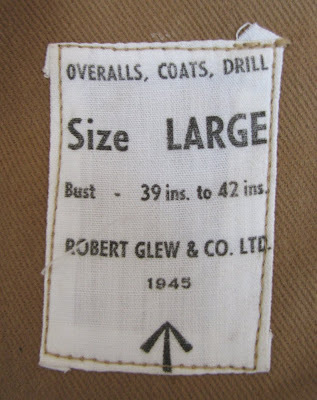 I ended up getting two coats; I bought one cirva 1944 for myself yesterday and then went back today to buy another one dating back to 1945 for Fiona Timantti. The two coats are basically identical even though they were made a year apart. They're the same color and size and both come with a belt. Now, these are not the most glamorous coats of all time but I think they're really special. It is not often that you come across authentic women's WWII era army pieces - and in deadstock quality, nonetheless! I'm not gonna lie to you, I was giddy with joy to find these! 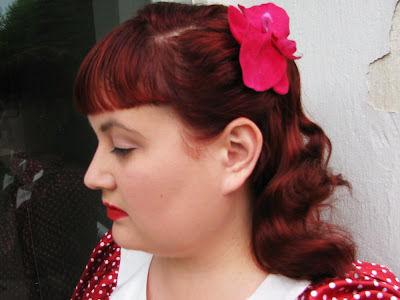 Many thanks to BaronessVonVintage for the last photo! Vintage Fashionistas is a series of interviews with fascinating and inspiring dames that impress me with their fabulous style, killer smarts and fun projects. The series kicks off with an interview with Julie, the brains - and beauty - behind Fab Gabs. If you frequent on Etsy, there's no way you've missed Fab Gabs, which is one of the most fabulous vintage shops on the block. Julie truly has some of the most beautiful pieces on sale, all of which are wonderfully presented in her Etsy shop. A larger lady like myself also appreciates the fact that Fab Gabs caters to all shapes and sizes. Grab a drink, sit back and read up on how Julie started her shop, learn what the most prized item in her personal collection is and check out her killer tips for buying vintage! Tell us a little about yourself: where are you based, what do you do? I'm based in Portland, Oregon - although I'm looking to move to a more glamorous city - San Francisco. But right now, it is rainy Portland. 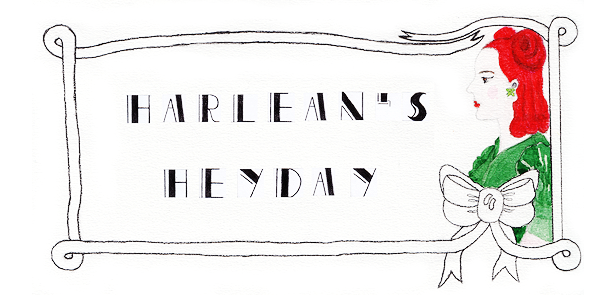 I sell vintage clothes, shoes, hats & accessories for women - and men, too - on Etsy. I'm really immersed in the vintage scenes where I live and the places I travel. I go to rockabilly shows, I swing dance a little, I attend Art Deco preservation events. I heart me a good tiki bar! I love to be surrounded by vintage culture. What initially sparked your passion for vintage fashion? My mother. She was a really classic lady, and she wore vintage hats and gloves - on Sundays, at the very least. Her style wasn't exclusively vintage, but she wore what looked good on her, no matter what era it came from. Both my mother and dad collected old kitchenwares and knick knacks for the house, so I grew up going to small dusty antique shops and thrift shops for weekend excursions. My dad recently gave me the set of Decoware for the kitchen he and my mother collected together - that really meant something to me. And it looks terrific in my kitchen! When and how did you get into selling vintage? Like many collectors and sellers, I dabbled in selling for a few years before I settled into it full time. When you're out hunting thrift shops for yourself, it is hard not to pick up other terrific deals you come across. A good friend of mine, Lisa (Eagle Eye Vintage) used to be my partner in crime, and through 2005 and 2006 we had a little business on ebay called "Those Vintage Girls." Then, I did more dabbling on my own. Fab Gabs wasn't "born" until sometime in early 2008, and it wasn't recognizable as the business it is today until November of 2009. Summer has suddenly graced us Finns with its presence. The temperatures have been over 25c these past few days, which is a massive leap considering that it was still less than 10c just last week! This past week the leaves have broken out in the trees and the grass is green, which means that I'm a very happy girl! I really can't get enough of summer - but sadly summers are very short in this country. So I'm making most of this weather by going to the beach every day. I've been having picnics with friends and just reading and enjoying lazy days by a lake nearby. Last night was "The Night of the Museums", which meant that you could visit most of the major museums around Tampere for one flat fee. The gf and I went to three different museums. Our first stop was the Tampere Art Museum, which is currently showcasing an exhibition of photos by Anni Leppälä, the Young Artist of the Year 2010. Do check out some of her work via the link (scroll down), her aesthetic is quite beautiful indeed and includes many nostalgic elements, from old objects and buildings to vintage clothing. 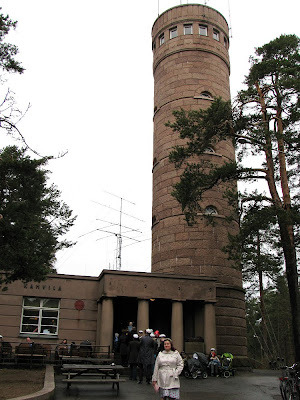 Next up was the Emil Aaltonen Museum at Pyynikinlinna, a stunning deco building that was once the home of Emil Aaltonen and now a public museum that exhibits his large collection of art. Emil Aaltonen (1869-1949) was the undisputed king of Finnish shoe design so there was plenty to see for not only art lovers but also for those of us interested in costume history. Lastly, we visited the stunning Häme Museum at Näsinpuisto, a park that I've somehow never been to before. The building is Baroque revival style and is now open to the public for the first time since 1998. We also got to ride a 1950s bus between each museum stop, which was pretty exciting! 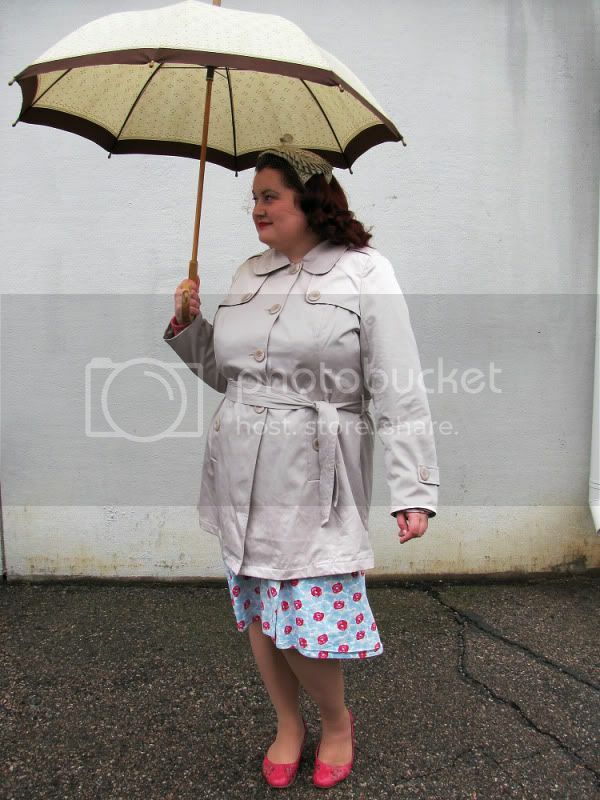 I'm pleased to say that I saw a couple of other girls wearing vintage dresses too, which made me smile. Shoes - Modern but I can't remember where from! Even though I can't say I love Cover Girl as a film, I really, really adore Rita Hayworth as showgirl Rusty Parker. She's radiant in every single frame of the 1944 Technicolor flick and the camera just loves her. Cover Girl is not only a must see for Hayworth fans but also for admirers of 1940s fashion. The wardrobe is one of the most beautiful I've ever seen in a film! I made screencaps of the film for my upcoming Rita tribute site and thought I'd do a little picspam of some of my favorite Rusty (and Maribelle) hairdos, hats and hair accessories, which are just glorious, not to mention inspiring! I think I shall make an attempt at one of Rusty's signature hairdos soon. I began with a bang! 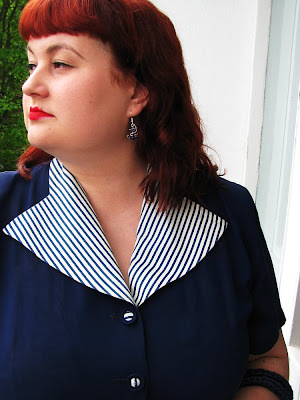 Harlean's Heyday - Riikka of Harlean's Heyday is a fellow curvy gal and vintage lover from Finland. 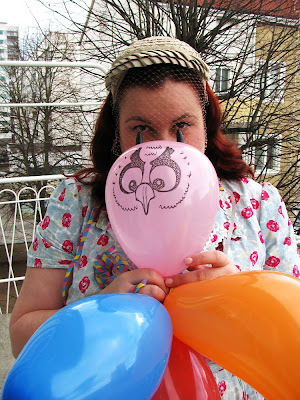 With great style and fab film reviews, this gorgeous gal is on my top favorites list! Happy Mother's Day to all of you mommies out there! Today is not only Mother's Day but also Tampere Vintage, our city's very own vintage fair. It was actually a big event with burlesque and swing dance performances, music by Sweet Jeena and her Sweethearts and a fashion show as well. Over a thousand people attended Tampere Vintage, which is definitely an impressive number for a smaller city. I was surprised just how busy it got! I got there early with one goal in mind; to focus on accessories, more specifically shoes, hats and handbags. And I actually found just what I needed but I'll get back to that later. 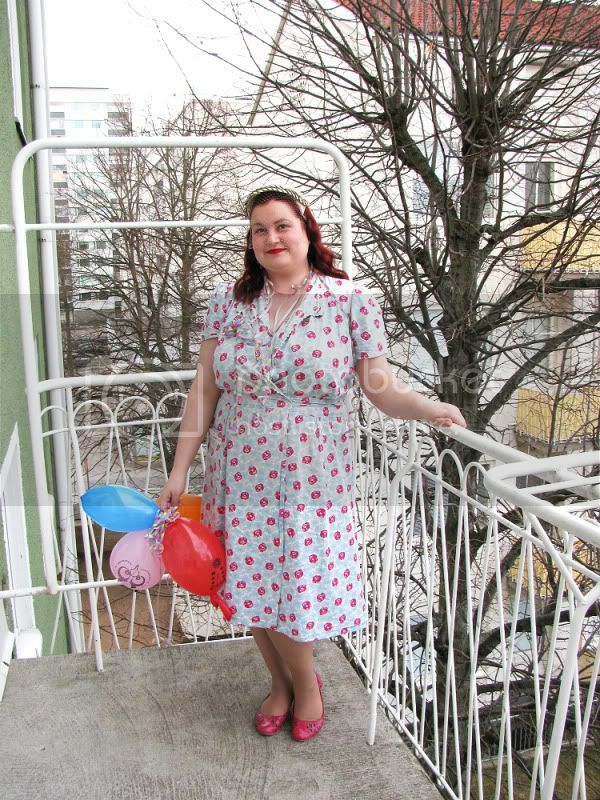 I generally have a hard time finding (affordable) pre-1950s vintage items in Finland but this time the the sellers had plenty of gorgeous 1930s and 1940s items up for grabs. I also had a great time seeing old friends and meeting new people, including the fabulously well dressed ladies and gents from the Fintage forum. Dress - 1940s vintage, Mme Renauld (via Ebay). This is one of my absolute favorite dresses! I only wish I had actually had the time to iron it this morning, haha! The question people often ask me is how I got into vintage fashion. Well, it has been a long time coming for me. My mother introduced me to classic movies at a very young age. There's old video footage of me from a trip to California in 1992, when I was eight years old. I was obsessed with one Scarlett O'Hara - and still are - and the home movies show me acting out scenes from Gone with the Wind and rocking a similar southern belle hat as Vivien Leigh in the movie. Quite a sight I must have been, a tiny diva! I also got a vintage photo of Vivien as Scarlett from Los Angeles and still have it today. I was truly fascinated by the stars of the Golden Age of Hollywood, especially their personalities and glamorous looks. Vivien and Marilyn Monroe were my very favorites. I used to drift a lot as a teenager and often wore 1960s summer dresses. But I didn't particularly care about style back then - I was busy writing zines, playing in a band and doing activist work, things like that. I suppose my look has always been somewhat similar to what it is today in that I've always prefered skirts and dresses to trousers and I've always enjoyed girly things. I was introduced to repro vintage clothing around 2004 and I got my first Stop Staring! dresses. 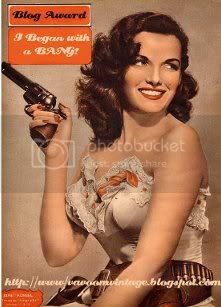 I was really into pin-up and burlesque at the time. I suppose it was also my ever-growing love for classic film that sparked my passion for vintage fashion. For a long, long time I unfortunately subscribed to the notion that plus size vintage simply does not exist. I was glad to realize a couple of years later that it simply is not true! In fact, there's plenty of vintage for the larger ladies; you just have to be patient, know where to look and how to search online, which is what I have learned with time. I was on a very tight budget during my university years and did most of my shopping at Monsoon sales. 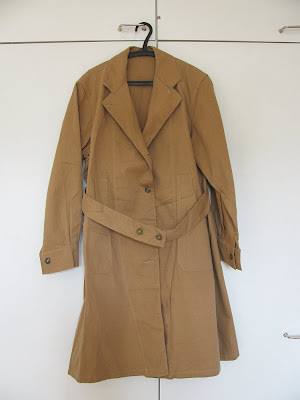 Not that vintage has to be more expensive than your general high street fashion but when you're of a rare size it can be hard to come across such items in vintage while drifting. So sometimes it is a good option to check out local high street shops for vintage inspired clothing when you're on a very tight budget. It worked for me. I am not particularly creative or artistic so vintage fashion is an important way for me to express myself and my personality. I've learned that a pretty dress and a little red lipstick can really brighten up a gloomy day! My blog friends inspire so much. It is so wonderful to have a supporting community of people who are creative in their way of dressing instead of conforming and looking like everybody else. Thought I'd post a couple a couple of tips I wish I had known when I was getting into buying actual vintage items (especially online, which is where I do most of my vintage shopping). Never go by size, always, always, always by the measurements given. Modern and vintage sizes are totally different for the most part. Measure yourself carefully and always double check the measurements provided of a garment you're buying online. Remember that the measurements given are of the garment itself and not your actual figure measurements. The dress should always be an inch or two larger than you are to ensure the perfect fit and that the dress drapes beautifully on you. Obviously this depends on the era too, like 1920s flapper frocks were meant to fall loosely. Yes, vintage shoes really are that small and narrow. Be extremely cautious when buying shoes online and always compare the measurements given to a pair that fit you well. Be picky. Even if something is vintage and cheap, it doesn't mean you have to buy it. Carefully consider the condition of an item and whether or not it suits your personal style. Don't forget accessories and undergarments. 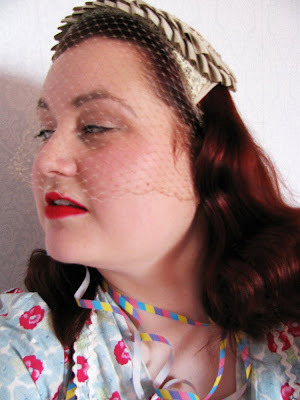 Something like a crinoline may be just as important to a 1950s look as the dress itself, not to mention something like red lipstick to complete a vintage look. If your size is very hard to come by, I would warmly recommend looking into ordering custom made items. I can personally recommend BBBB and Top Runway for beautiful custom made items. 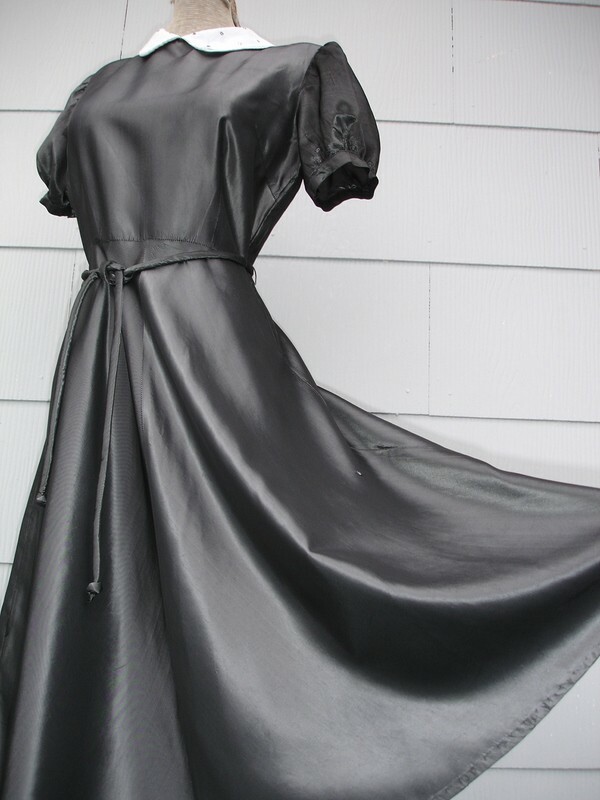 This 1940s taffeta swing dress has me drooling. Isn't it absolutely gorgeous? I love the Peter Pan collar that sparkles with rhinestone, the full skirt and the puffy sleeves. This darling number reminds me of the dress that Ginger Rogers wore in Swing Time (1936), which is one of my dream dresses. Unfortunately, it is too small for me (bust 35-37", waist 26-28") so it is for yours to take for $62.00 over at vintagefoe's Etsy shop. 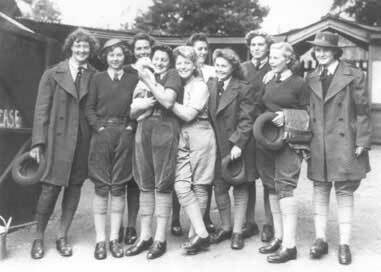 Unfortunately it rained and the weather was nasty and cold so plans of an outdoors picnic sadly had to be scrapped. We met up with some friends and drove to Pyynikin näkötorni, a deco tower circa 1929 that stands on top of Pyynikki, between two lakes. It is a really gorgeous spot and the views are absolutely stunning! Munkkia ja simaa! 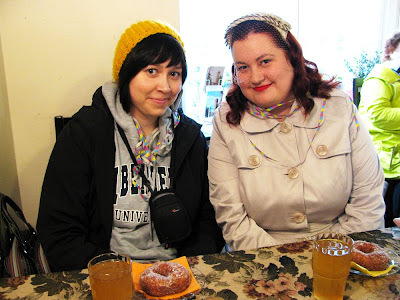 We enjoyed some traditional Vappu treats at the cafe. 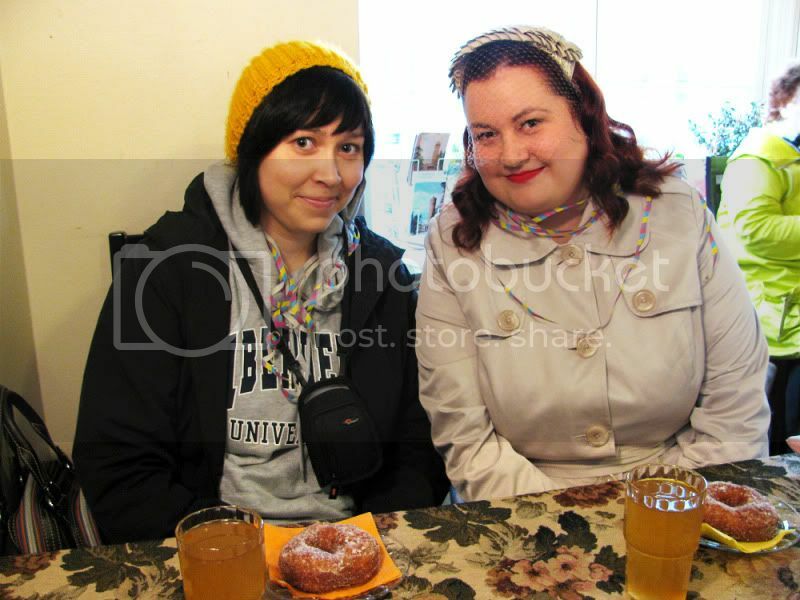 People say the donuts are the best in Tampere. Yum! Headed to our friends' place for an indoors picnic. 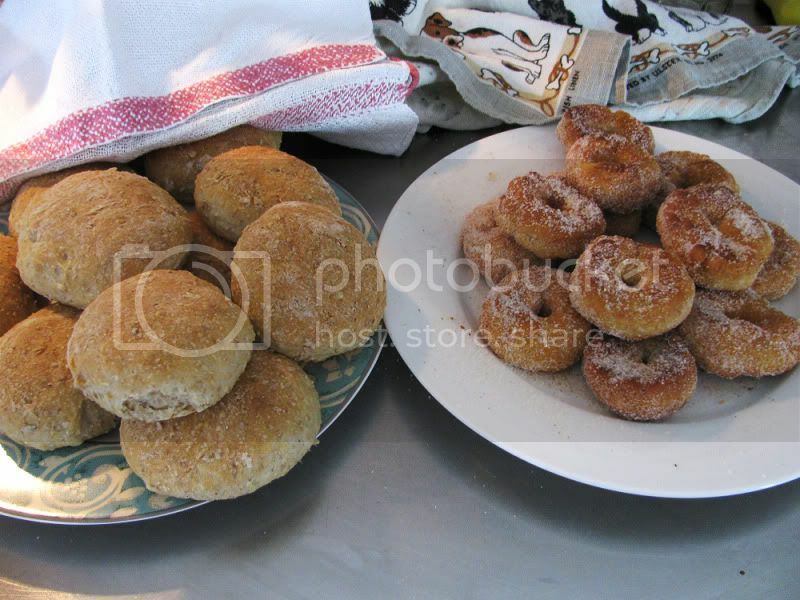 Fresh, home-made buns and donuts! Double yummy! 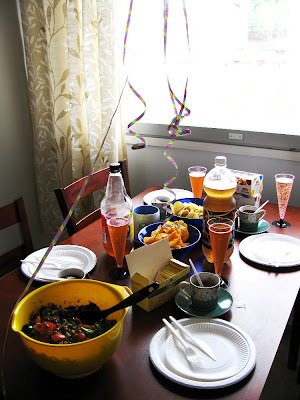 A May Day feast with lentil salad, tea, mead, chips and tippaleipä. 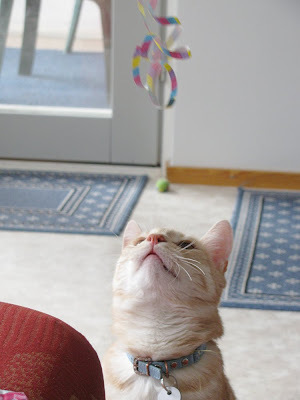 Playtime with the very adorable cat. I wore one of my favorite vintage hats. It is from the 1950s and I got it via Etsy. 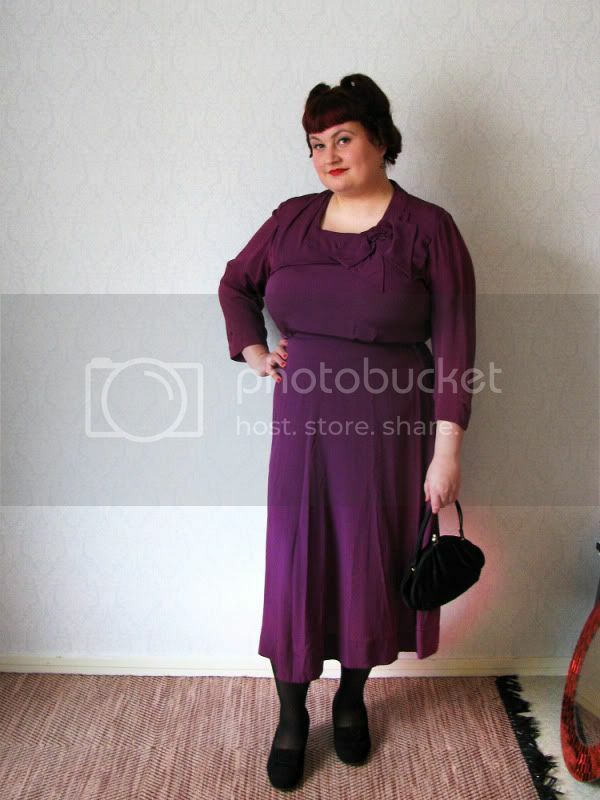 Another Etsy find, a wrap dress from the 1940s... I just adore this dress! And some crazy balloons, of course! 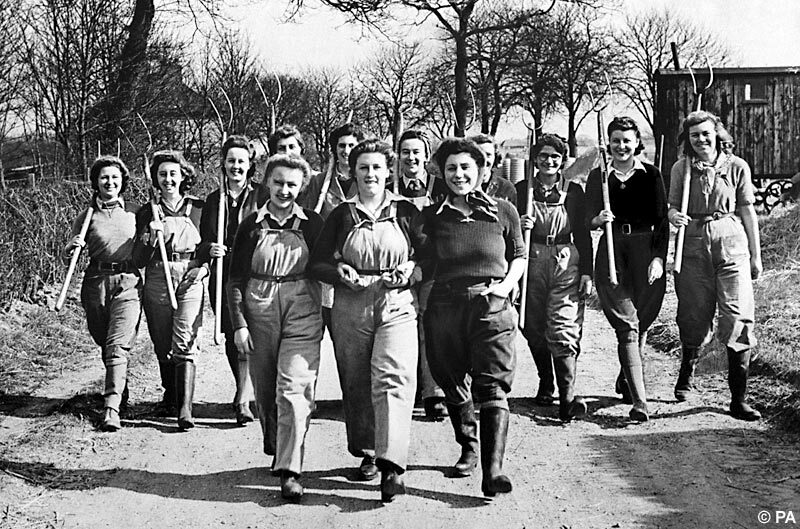 Hope you all had a nice May Day and hopefully much nicer weather than we did.